This Florida county voted for Trump. But it's a lot like the sanctuary cities he loathes. Volusia County is working to build trust in its immigrant community, which is vital to the local economy — even if that means defying Trump and Sessions. PIERSON, Fla. — When a trio of squad cars pulls up to the fern field, the workers — bent over, piling up bundles of freshly cut feather-like fronds in the late-morning sun — grow tense. Sgt. Roy Galarza, 34, and his brothers, both sheriff's deputies, jump out. Roy jokes in Spanish about who will cut the most ferns that day, and greets an uncle who works there. Slowly, the workers, many of whom are undocumented immigrants from Mexico, walk over to the cruisers and begin to chat: One woman complains about a traffic stop; another talks about a friend’s misunderstanding with police involving her children. The Galarza brothers — Roy, Daniel, 36, and Billy, 26 — aren't there to arrest anyone. 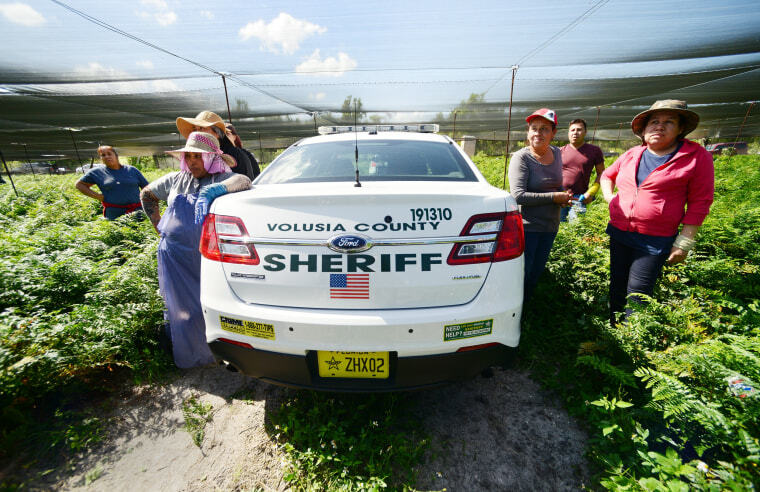 They're visiting the fields as part of the Volusia County Sheriff Department's redoubled efforts to build trust in an immigrant community that fears the police and the deportations President Donald Trump has promised. Trump has repeatedly demonized so-called sanctuary cities as hotbeds of crime where illegal activity permitted by politicians runs rampant. He tweeted on Monday that such policies are "inspired" by Democrats. Meanwhile, his Justice Department has threatened to pull federal funding from major urban areas that it has claimed are in violation of federal laws, and, last month, announced a lawsuit against the state of California over its policies that aim to protect immigrants from deportation. But there's another, less publicized part of the sanctuary movement — largely rural counties, like Volusia County in Florida, which favored Trump in 2016 by 13 points, but whose law enforcement officials say they need to protect immigrants working in the community and are pushing back on federal, state and local efforts to shut them down. Volusia County is home to NASCAR's Daytona 500 and Daytona Beach; with around a half million residents and 1,101 square miles, the county sits on the state's eastern coast about an hour's drive north of Orlando. Its largest city is Deltona, with an estimated 90,000 residents, but it also includes the tiny town of Pierson, which calls itself the fern capital of the world. "As soon as Trump took over, that was the biggest concern — people being deported," Roy told NBC News. "That's going to affect the relationship with the Hispanic community and the sheriff's office, (when people worry), 'Now if I get pulled over, what’s going to happen?'" Roy worries that domestic violence frequently goes unreported in Pierson, and knows that muggings do because criminals target undocumented immigrants. "They know they're not going to report it,” he said. Indeed, workers interviewed through a translator said they all feared law enforcement, but felt they could cautiously trust the Galarza brothers. In 2016, Volusia County elected both Trump and a sheriff bent on restoring trust within the immigrant community. "Where does crime come from? Crime comes from when you marginalize a race or a religion and you knock them out of mainstream society," said Sheriff Michael Chitwood, a political independent who was sworn in the same month as the president. "When I first got elected, I went to every church and asked the pastors to trust me and said there's a different way we're going to do things." Chitwood said he instituted a new anti-profiling policy and began doing regular outreach at churches and schools, trying to convince the community that working with the police won't end with a deportation. At one church visit, the sheriff told NBC News, four or five people came up to him to tell them that one deputy was constantly pulling them over. They showed Chitwood photos of the man on their cellphones. After Chitwood checked the department's records, he found that the deputy was routinely going 10 miles out of his assigned zone to do traffic stops in immigrant neighborhoods. Chitwood opened an investigation the next day, and the officer retired. The sheriff wrote a new policy that said police need significant probable cause, like a visible tattoo signaling membership in a gang or cartel, to ask about citizenship at a traffic stop. There is no clear definition of what makes a city a "sanctuary" for undocumented immigrants, and the majority are actually counties, according to groups that track it. The Justice Department declined to offer an official definition of the term. Instead, DOJ pointed to letters it sent municipalities that said refusing to inquire about immigration status and failure to honor ICE detainer requests — when the federal government asks municipalities to hold someone in prison for 48 hours plus weekends and holidays, so that Immigration and Customs Enforcement can come and get them — were a violation of federal law. Even though Volusia stopped honoring detainer requests in 2014, Chitwood is quick to argue that his county is not a sanctuary — his department communicates with ICE, it just doesn't do their work for them, he said, noting that the county receives few ICE detainer requests. "If ICE tells me that I have somebody wanted for murder, we're going full force to get him. But if you're telling me, I've got to go get somebody who overstayed their visa? I’m not trained or equipped and I don't have the manpower to do that," Chitwood said. As of early April, Volusia had just one detainer request from ICE for 2018. The individual, who was found with a pound of methamphetamines, also had an outstanding criminal warrant and remained in custody because of the latter. "I have to look at what the facts in Volusia County are, and the facts in Volusia County are $30 to $60 million (of the county's economy) comes from the farm fields in Pierson," Chitwood said. "Without immigrant or itinerant labor, those farms cease to exist. I'm not going to go up there and go into the fields and conduct traffic stops and create a problem where I don’t have a problem." Trump's Justice Department, headed by Attorney General Jeff Sessions, has spent the last year pressuring counties and cities that officials argue have sanctuary city policies — everywhere from Albany, New York, to Albuquerque, New Mexico — to enforce federal immigration laws. They have also tried to make a popular federal grant contingent on certain immigration enforcement policies, though the measure has been shot down by courts. In January, 17 Florida sheriffs signed a deal to be reimbursed by ICE for some of the significant costs that come with detaining immigrants at ICE's request. "When somebody's in our jail and they've committed a crime and ICE asked us to hold them so they can turn them over to them," Pinellas County Sheriff Bob Gualtieri, one of those who signed the deal, said. "That's what we should do." He said he doesn't see widespread fear in the immigrant communities in his county, and believes declining to honor ICE detainers is "appalling." Following the president's lead, states across the U.S. have also sought to punish sanctuary cities. According to the National Council on State Legislatures, 54 bills tackling sanctuary cities and immigration enforcement issues were under consideration in 25 state legislatures this year. Florida considered a bill to ban sanctuary cities and insist municipalities honor ICE detainers, but it stalled in the state Senate. One law has been enacted in Iowa; another was vetoed in Virginia; 41 are still pending as of early April. When asked about Volusia County's policy on detainers and efforts to build trust within the community, the county's Republican Party chairman, Tony Ledbetter, said he wasn’t aware that the county jail hasn't honored ICE detainer requests since 2014. "I didn't know that, but I don't agree with that. If they're criminals and they're here illegally, then everybody should be in favor of getting the situation resolved," he said. He added that he believes Chitwood is a good sheriff but "if he’s trying to create space between me and the president, I'm siding with the president." Chitwood, who publicly opposed Florida's anti-sanctuary city bill in an op-ed, said he learned the hard way what mistrust looks like in his community. "We had a homicide here when I was police chief in Daytona," Chitwood recalled. "We screwed up." Called to investigate domestic violence, he said, police were told that the victim was undocumented and officers asked her about her immigration status. "She shuts down," Chitwood said, recalling what he saw on the responding officer's body-cam footage. "We come back eight hours later when her youngest child wakes up, and finds her throat slit by the husband. When you watch that video, you say if the officers had not been so overbearing about her immigration status … she might be alive today." Born to undocumented parents, Roy, Daniel and Billy Galarza grew up in Pierson among the ferns, which are sold for their decorative value. The brothers' father, Pantaleon, who just became a U.S. citizen, crossed the Rio Grande on foot and still works in one of the fields they visited on a recent sunny afternoon. The brothers have vivid memories of a childhood spent cutting plants for cents on the bundle — later sold to florists — before and after school, on weekends and during vacations. Roy hated how ice coated the ferns in the winter, soaking his gloves with freezing water. Daniel used to dramatically throw himself down on the ground, tired of cutting the thousands of fronds that would earn them each $40 to $50 a day, depending on how hard they worked. Billy was the baby of the family — just 10 when his mother died — and his brothers and sisters let him slack off. Because Pantaleon, 65, had worked as a military policeman in Mexico, Roy said, he didn't fear law enforcement as much as others in Pierson's immigrant community did, but he always told his children to stay out of trouble and focus on getting out of the fields. "My dad was like, just don't cut fern," Roy said. "It was over and over again, 'I’m doing this for you.'" Pantaleon beams with pride when his sons visit in their squad cars. His seven children have all left the fields for better jobs — one sister is an assistant principal, another works doing accounting for one of the fern distributors — and his grandkids are thinking big, too. Roy’s eldest son, 15, wants to be a doctor. "Look where we're at," Roy said of himself and his siblings. "He's thrilled."